An organisation campaigning against wealth inequality released this YouTube video to show people's perception of what fair wealth distribution would be, and compare it to the actual situation. Reveal hidden text for a description of the video if you can't view it. how wealth is actually distributed. Each result is shown using an infographic based on pound coin symbols, with 100 symbols in total, and shows the wealth distribution for the population divided into fifths. 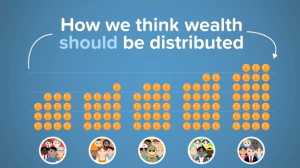 By animating the coins from one infographic to the next, the video makes a powerful case for unfair wealth distribution. Choose a similar question where you can investigate how people think something should be, what they think the state of affairs is, and then what it actually is. You could choose an important issue in your school, or a political issue, or an environmental one. You will need to collect some primary data to find out people's beliefs, and then do some research to find out what is actually the case. To present your ideas, you could make some infographics like the ones in the video. You may even wish to make a video yourself! Send us pictures of your work, and if you do create a video and upload it to YouTube, let us know so that we can share it! Here is an explanation of where the data for the video came from. This page explains a little about who has what. Carroll diagrams/Two way tables. Comparing data. Processing and representing data. Handling data. Frequency distribution. Collaborative. Interpreting data. Collecting data. Probability distributions, expectation and variance. Resourceful.